Storytelling is a time-honored tradition which began before humanity had the ability to create long-lasting printed documents. The first stories were a way of passing on an oral tradition and history of various cultures around the world. There is still a storytelling tradition in many cultures, although as communities spread out, storytelling has moved to written, printed, and now digital methods of recording the tales. Oral traditions created a rich history for ancient cultures that gave rise to much of what we call myths and legends today, a blend of history and religion which gave purpose to people who lived short and often harsh lives. The development of the printing press gave stories new life because they could be disseminated on a broader scale and replicated easily. No longer were scribes necessary for copying expensive books and papers. Not only was the rich, cultural history and religious beliefs of various people shared among a wider community, but pure fiction was written for the purpose of entertainment and enjoyment for the masses. For those who were not taught to read, stories were read and passed around by those who could. While it has become easier to distribute stories in the digital age, and more of the world's population is educated enough to read, storytelling continues to be a powerful way to distribute a message to people. Computers and the internet make spreading the word faster, but the concept of an oral tradition is easily seen in the many repetitions of news stories online from different slants or points of view. The question lies in how an entity or brand can create a unified story to present to an audience or market. With the unique ability to duplicate digital image and print and distribute them through many channels, storytelling can be a powerful tool for marketing a company or organization. 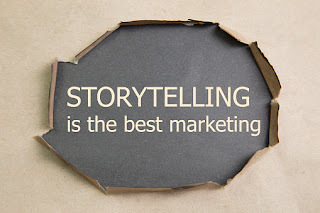 A recent article in Search Engine Journal(https://www.searchenginejournal.com/5-benefits-using-storytelling-marketing/164213/) discusses the benefits of storytelling as a method for branding. The author, Katy Katz, talks about how storytelling creates connections and potential bonds between a brand and a market. When thinking about storytelling for a brand, call to mind some of the brands that you grew up with that have become common words in the American culture such as Kleenex, Coke or Pampers, often used to replace the actual word for the item being talked about. While creating a storytelling campaign for your own brand may not turn it into a common household word, you will still be able to cement the story with the brand name to create lasting memories in the minds of your audience. Katz mentions 5 benefits to brand storytelling in her article. 2. Storytelling is a natural motivator. 4. Storytelling makes content exciting. 5. Storytelling can make something old, new again. How Can You Use these Benefits to Your Advantage in Marketing? Since most businesses have competitors that offer products or services that are similar to theirs, branding offers a way to show your differences. Creating a brand story or even just telling your brand's story in a cohesive manner can give your audience reasons to bond with you beyond pricing or product quality. An excellent example of brand storytelling is the way Tom's Shoes has incorporated their brand name with their history of giving. (http://www.toms.com/stories/giving/10-years-of-giving-together) They have created not only an excellent product, but a compelling reason to buy from them.